Surprise! I'm co-hosting a giveaway today with 9 other blogger friends! 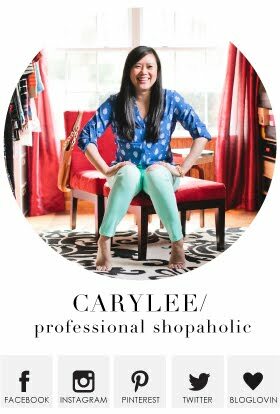 You didn't think I would taunt you with all the awesome Nordstrom Anniversary Sale pieces without giving you an opportunity to shop with some free money, did you? Details on how to enter are at the end of this post. 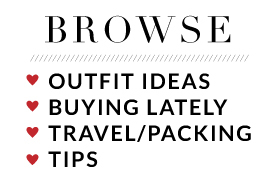 But first, I wanted to share some styling ideas for my new Twill Peplum Jacket! Wait, let me back it up a second! Did you catch my big haul post yesterday? If not, please jump over here and do that first and then come back here and finish this post, mmkay? Alright, so back to the jacket! I was not lying when I said it is one of my favorite purchases from the sale. I've decided I'm fine with an XS and didn't need to order the XXS after all. I wasted no time wearing it, and I should mention that it's been in the 90s, but I was still able to wear it because it's more like twill button-up shirt weight than it is jacket weight. Sometimes both olive and burgundy can feel too fall to me, or at least, I don't crave the colors as much as I do in the cooler months. But that wasn't going to stop me from wearing this jacket today. To keep it summery, I chose my light-washed denim instead of my typical dark pair. And then pops of turquoise always help summer-ize an outfit for me, not to mention that I love the way olive and turquoise look together! The stripe cami was a nice neutral backdrop to finish this off with little effort! This jacket will be great over both thick and thin layers depending on the season, and here are three more ways I plan to wear it! 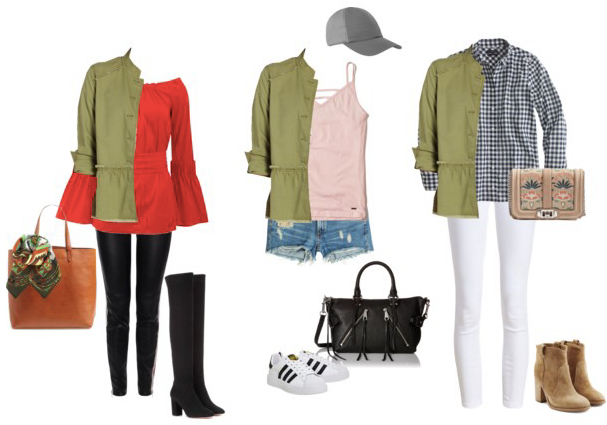 Olive pairs well with so many colors, so you can style this just like you would your military jackets but in a silhouette that is more flirty and fun. It would be great over a tank dress and peep toe booties also! Alright, short and sweet today because let's face it, this week has been exhausting and I'm sure your heads are spinning from all the sale posts anyway! So let's get straight to the weekend, and more importantly, the giveaway!! 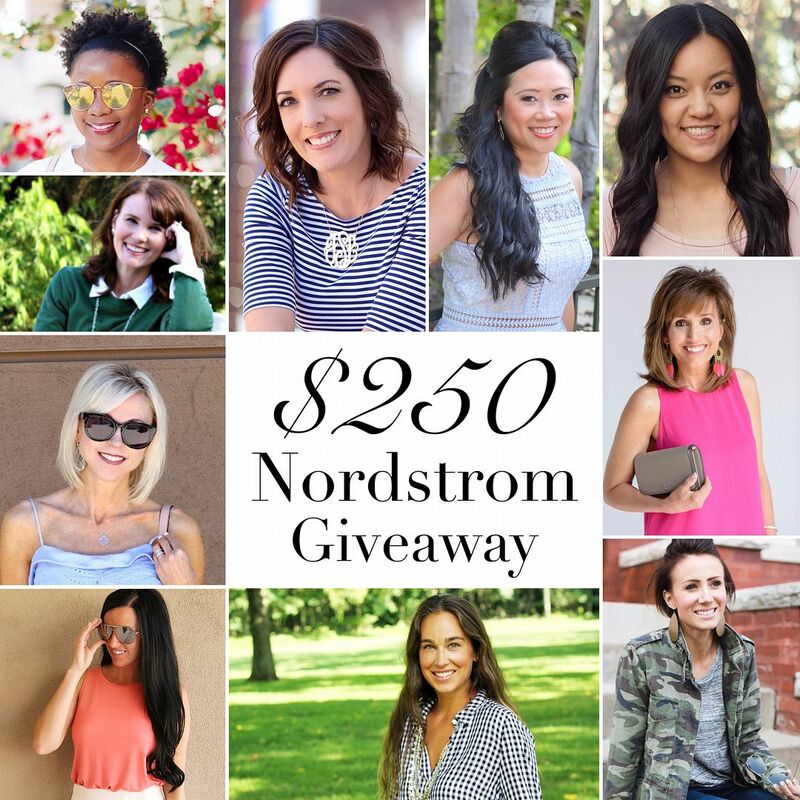 Enter the $250 Nordstrom Gift Card Giveaway by using the Rafflecopter below! You do not need to perform all tasks to enter, though the more tasks you do complete means more chances for you to win! Good luck! This combo is so good and loving the light wash jeans I need to pull mine out. 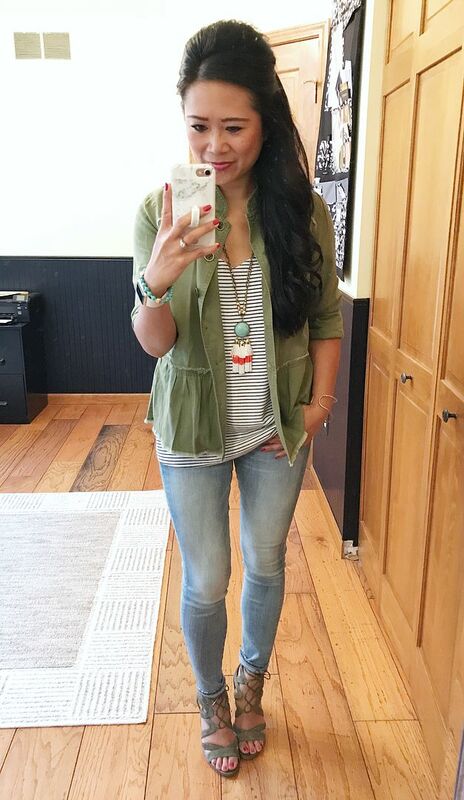 Olive jackets are my favorite and this one is very tempting! Thanks for sharing the multiple styling options! Super cute! Can't wait to get my hands on it!